Just when Samsung was getting neck-and-neck with Qualcomm in terms of LTE modem abilities in its Exynos system-on-a-chip solutions, the Texans took to the airwaves to announce their next big thing. 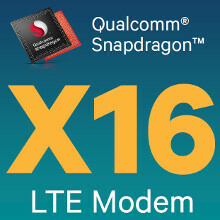 Qualcomm's new X16 LTE modem is capable of sustaining data speeds of up to the whopping 1 Gbps. Such LTE Advanced Pro speeds are present in only a handful of countries for now, like South Korea (oh, the irony! ), Australia or Sweden, but when carriers here are ready with such rollout, Qualcomm will have the modem to match. Verizon has a pilot 1Gbps network a its HQ already, and, needless to say, says that such fiber-like speeds are meant for the next generation of video streaming. For now, suffice it to say that the modem supports Cat. 16 LTE speeds, while others are up to Cat. 10, and is built on the trendy 14nm process, meaning a much smaller footprint and power consumption than before, despite doubling the speed over previous generations. The other interesting tidbit about Qualcomm's X16 LTE radio is that it is created with a new modular architecture that will allow quick scaling and adaptation to various tasks, scenarios and IoT gadgets that will need LTE connectivity. The first units are shipping to customers for sampling as we speak, and will be available in retail devices in the second half of the year. Given that Apple always try to keep the iPhone at the forefront of LTE connectivity - the iPhone 6s supports a record number of bands - we wouldn't be surprised if Qualcomm's new fast and efficient modem makes it into the iPhone 7 and Apple A10. As for Qualcomm's own chipsets? We doubt this modem will see the light of day before Snapdragon 830 goes into devices next year. I mean yeah, but what is more fun than blowing your data in a half a second and waiting an entire month to get that thrill all over again? Good times. @joeytaylor You must be fun at parties. No you have restrictor in settings on mobile utub.. "play hd over wifi only" don't forget that.. Better get unlimited before it's gone! Yeah, f*** them for advancing technology amirite? who cares? NO network provider can provide such speed at this time(or even near future) so this means nothing. just going to say the same thing. Not only that but even if providers did match this speed, caps and cost would immediately kill it. note! I don`t mind the technology and future proofing but this is like having a 8K TV that no one can get anything out of until the suroundings keep up. I would rather they take a look at more energy efficient LTE modems instead. Not the surrounding, but your eye should keep up, in fact the eye of the while human race. This will always give a reason to improve the network. you are correct although I think its just to soon for these kind of speeds.. I hope your right tough. So companies should stop innovating then? read again. im all for it just by the time the have installed all the HW this modem will have yet another update and the phone /tablet its in is old. Exactly. Only country that actually is rolling super quick LTE service is probably korea where samsung releases their special high speed LTE devices. So in that regard, who's eating whose dust? It's a sarcasm "/s" because no carrier right now can provide that kind of insane speed on mobile. I said "in under 5 minutes" because I'm not sure so my statement is valid.